That One Group, our Winter Champions, wins the Spring Championships as well. The team of Richard Gortchakov, Matthew Manibusan, Melissa Manibusan and Jomar Soy beat GSWT, which was comprised of Rizal Aliga, Brianna August, Tashayla Gilmer and Coach Guiducci. Our Fall Champions Stephanie Cajina, James Ercia, Justin Ercia and Romiland Lobusta placed 3rd in the 19 team field. The Springstowne Wildcats won their 13th consecutive GVRD Vallejo City Wrestling Championships scoring 283 team points to top Franklin, Solano and MIT at the 17th Annual event. The Wildcats were paced by Jamie Luke, Marychris Peralta and Valeecia Frazier who won their 3rd straight Vallejo City Championship titles. 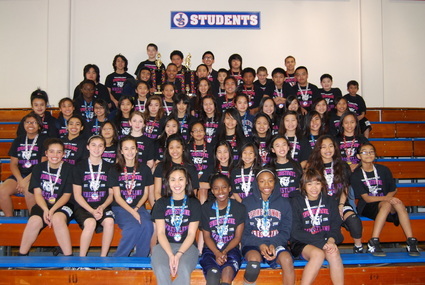 The Wildcats also had a plethora of 2-time City Champions in Arovan Deguzman, Richard Gortchakov, Chris Deleon, Vincent Abena, Justin Ercia, Kristeen Duculan, Thao Truong, Brianna August, Flordelee Madamba, Tashayla Gilmer, Mylinh Pham, Cami Ann Pascua, Melissa Manibusan, Shelly Avelino and Ayanna Jones. Also scoring key points were Steven Le, James Mitchell, Matthew Manibusan, Rizal Aliga, Michael Bell, Austin Smith, Jasmine Capiral, Alanna Cuevas, Henly Mae Solar, Erin Dejesus, Valerie Franco, Deja Ramos, Jessa Mae Huerta, Jasmin Labra, Isabella Mejia-Doyle and Jennifer Carino, who all won individual titles as well. The Springstowne Wrestling Academy went 3-0 at the GVRD's Vallejo City Duals defeating MIT 84-0, Solano 84-0 and Franklin 82-6. Key performers were Jomar Soy, Chris Deleon, Matthew Manibusan, Rizal Aliga, James Ercia, Austin Smith, Justin Ercia, Romiland Lobusta and Flordelee Madamba. The group all went 2 and 0. The following wrestlers won gold medals at the Springstowne Wrestling Academy Championships on April 30, 2012. Tyrone Austria, Steven Le, Richard Gortchakov, Michael Phannavong, Jomar Soy, Chris Deleon, Matthew Manibusan, Rizal Aliga, Ivan Leal, Arovan Deguzman, Michael Bell, James Ercia, Austin Smith, Justin Ercia, Romiland Lobusta, Jasmine Capiral, Brianna August, Flordelee Madamba, Cami Ann Pascua, Marychris Peralta, Shelly Avelino, Jessa Mae Huerta, Jasmin Labra, Jessica Tabilos, Renee Manansala, Jamie Carino, Valeecia Frazier, Jennifer Carino, Harneet Sandhu and Ayanna Jones. 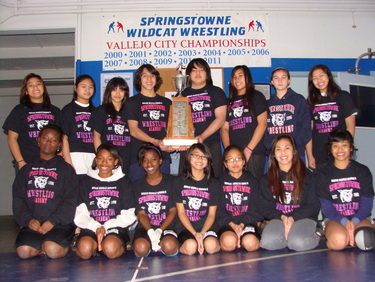 They will take part in the Vallejo City Duals on May 8th. The Springstowne Lady Wildcats won their 7th consecutive State Championship pulling ahead late of San Leandro's Bancroft Broncos by 4 points in the California Girls Middle School State Wrestling Championship event's closest finish in its 8 year existence. The event which drew wrestlers from 59 teams and clubs from as far as Orange County in the south and Ukiah in the North, saw the Lady Wildcats score 45 points to Bancroft's 41. The two teams have a storied rivalry as the Lady Broncos bested Springstowne in 2005 at the Inaugural event, before Springstowne began their streak of State Titles. 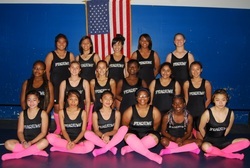 The two teams made history in 2008 as the 1st Middle School girls teams in the U.S. to compete in a dual meet. The Lady Wildcats, who trailed much of the day before staging their comeback, were led by Shelly Avelino who won the 118 pound championship and Briana August and Marychris Peralta, who also made the finals before placing second. Also scoring extremely valuable team points were bronze medalists Kristeen Duculan and Flordelee Madamba. Rounding out the medals for Springstowne were 4th place medalists Jennifer Carino, Jasmine Capiral, 5th place medalists Wy'Le Douglas, Valeecia Frazier, Harneet Sandhu, Ayanna Jones, Alanna Cuevas, Valerie Franco, Tashayla Gilmer and 6th place medalists Thao Truong, Cecily Kaluza, Deja Ramos and Cara McClinton. A contingent of 6th and 7th grade Lady Wildcats traveled to Benicia Middle School for a match night with the BMS Vikings. The group of young wrestlers performed well scoring 14 wins in 20 matches. The big winners on the night were Jamie Carino and Adriana Davila who each went 3 and 0, both scoring 2 pins. Isabella Mejia-Doyle went 2-0 with 2 pins, Daphne Rio was 2-0 with 1 pin and Jasmine Capiral was 1 and 0 with a hard fought 6 to 4 overtime victory. Special thanks to veteran Lady Wildcats Jessa Mae Huerta, Shelly Avelino and Jennifer Carino for their stellar coaching matside. Our Springstowne Wildcat Wrestling Academy cracked the Top 25 California Team rankings at the 2012 California Junior High State Championships in Fresno, CA. The Wildcats were led by Austin Smith's silver medal finish and Justin and James Ercia, who placed 3rd and 6th respectively. Vincent Abena, Rizal Aliga and Matthew Manibusan also competed and wrestled valiantly. With USGWA President/Founder Kent Bailo in attendance at the USGWA Northern California Championships, our Springstowne Wildcat Wrestling Academy blazed the trail with 47 medals. Tashayla Gilmer, Deja Ramos. 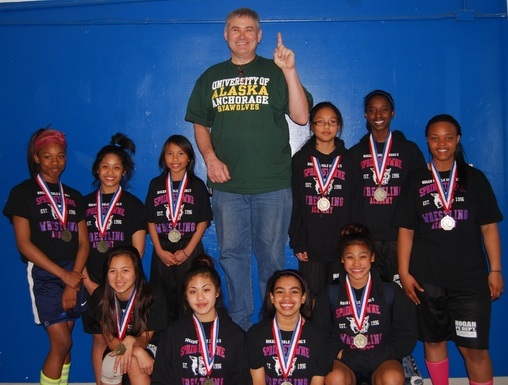 Supranee Noynil, Jasmine Capiral, Brianna August, Ayanna Jones, Jamie Luke, Marychris Peralta, Topaz Lewis and Shelly Avelino stood atop the podium as they all won Northern California Championships to lead the Lady Wildcats. The Springstowne Wildcats took to the mats at the 3rd Annual Hoang Van Thu Classic versus friendly rivals Napa Sal, Vaca Pena, Vallejo PAL and Bancroft. Scoring 1st place finishes for Springstowne were Matthew Manibusan, James Ercia, Jeazelle Umipig, Kristeen Duculan, Jasmine Capiral, Brianna August, Christina Sanchez, Alanna Cuevas, Flordelee Madamba, Cecily Kaluza, Deja Ramos, Cami Ann Pascua, Mylinh Pham, Jamie Luke, Tashayla Gilmer, Jessa Mae Huerta, Shelly Avelino, Jasmin Labra, Jessica Tabilos, Wy'Le Douglas, Valeecia Frazier and Ayanna Jones. The boys class saw Wildcat Alums Bethel's Franklin Avelino place 2nd in the SCAC. He qualified for the Sac-Joaquin Section DIII Championships, along with teammates Mitchell Gini and Stephen Grigg who scored 3rd place finishes in the SCAC. James Tapia of St. Patrick's made it to the North Coast Section Championships with a silver medal in the BSAL and he contributed to the Bruins 2nd place finish at the NCS DIII Dual Championships. Bancroft of San Leandro and the Napa SAL came to Vallejo to meet our Springstowne Wrestling Academy wrestlers at our Annual Novice Scrimmage. Our younger wrestlers took the stage while our veteran wrestlers had the night off and assisted with scoring and refereeing. Leading the way into the future were Nicole Ausa, Valerie Franco, Briana Dulay, Mylinh Pham, Suveen Pooni, Erlen Sunga, Jeazelle Umipig and Michael Bell, all of whom went 2-0 on the evening. Austin Smith led the Wildcat boys with his second consecutive gold medal, while the Ercia twins James and Justin scored silver medals. Matthew Manibusan and Steven Le rounded out the boys standings with bronze medals. The Lady Wildcats continued to turn heads in the girls division, where they scored numerous medals. 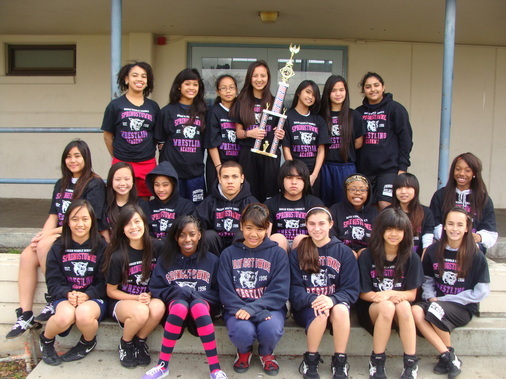 They were led by Shelly Avelino who won her 2nd straight North Coast Championship. Joining her with gold medal performances were Brianna August, Jamie Luke, Tashayla Gilmer, Jessa Mae Huerta and the Carino sisters, Jennifer and Jamie. Austin Smith and Justin Ercia secured TOC qualification after placing 1st and 2nd respectively at the Solano County Clash in Vacaville. On the girls side the Lady Wildcats won their 4th consecutive Solano County Girls Championship led by Jamie Luke, who won her 3rd straight Solano County Title, and fellow gold medalists Kristeen Duculan, Jasmine Capiral, Thao Truong, Alicia Cordero, Brianna August, Flordelee Madamba, Valerie Franco, Mylinh Pham, Cecily Kaluza, Cami Ann Pascua, Deja Ramos, Tashayla Gilmer, Melissa Manibusan, Shelly Avelino, Jessa Mae Huerta, Topaz Lewis, Wy'Le Douglas, Jamie Carino, Harneet Sandhu and Tanaya Stanfield. 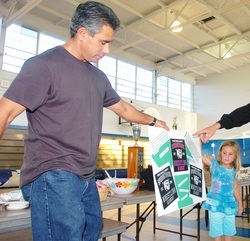 2008 Olympian Marcie Van Dusen chose our program to host a wrestling clinic on January 16, 2012. There were 101 attendees from throughout the Bay Area @ the clinic. Coach Van Dusen stated, "They were a great group of kids and I believe this could be a great place to continue to grow an even larger clinic in the future." Both the Springstowne Boys and Girls Teams took home 1st place trophies from the 6th Annual Justin-Siena Classic in Napa. Matthew Manibusan, D'Niko Green and Justin Ercia led the Wildcat boys with Gold Medal efforts, while Kristeen Duculan, Thao Truong, Brianna August, Flordelee Madamba, Valerie Franco, Jamie Luke, Cami Ann Pascua, Tashayla Gilmer, Marychris Peralta, Shelly Avelino, Jamie Carino, Valeecia Frazier and Ayanna Jones scored Gold to lead the Lady Wildcats. Kristeen Duculan, Jasmine Capiral, Brianna August, Flordelee Madamba, Cecily Kaluza, Deja Ramos, Tashayla Gilmer, Erlen Sunga, Marychris Peralta, Shelly Avelino, Allyson Tabas, Jamie Carino and Valeecia Frazier. Our Springstowne Wildcat Academy Wrestlers won their 4th consecutive tournament title from the Vallejo PAL "Bobby Gonzalez" Fall Wrestling Classic. They were paced by gold medal winners Steven Le, Jomar Soy, Matthew Manibusan, Kristeen Duculan, Thao Truong, Brianna August, Alanna Cuevas, Flordelee Madamba, Valerie Franco, Cecily Kaluza, Deja Ramos, Melissa Manibusan, Marychris Peralta, Shelly Avelino, Wy'Le Douglas, Jamie Carino, and Tanaya Stanfield. What? led by Stephanie Cajina, Romiland Lobusta, James Ercia and Justin Ercia take 1st after defeating Candylicious led by Hazel Solar, Ryan Dejesus, Anya San Nicolas and Justine Pascua. Bananas take 3rd place thanks to Tatiana Boyd, James Mitchell, Joanne Cabanlit and Supranee Noynil!!! Our revised logo was unveiled before 50+ Wildcat Wrestling families at our Annual Festival of Nations Potluck and our 8th Grade Travel Trips were announced. Our 8th grade boys will be traveling to Utah, while our 8th grade girls will run a split-squad between Washington and Maine.